All SUNLAND VILLAGE EAST 4 LO homes currently listed for sale in Mesa as of 04/19/2019 are shown below. You can change the search criteria at any time by pressing the 'Change Search' button below. 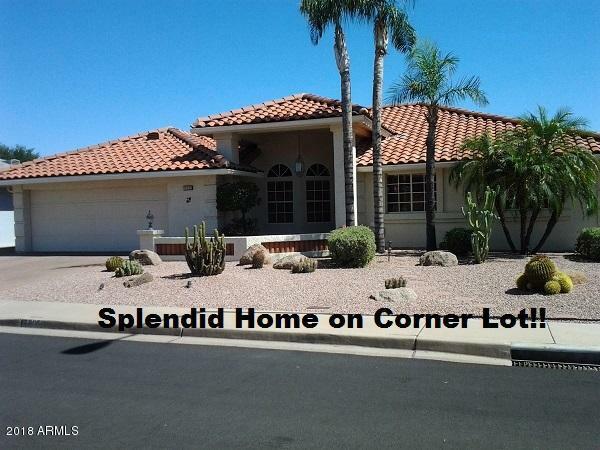 "Spacious Home on Corner Lot! A 215 Model with AZ Room and Sunroom additions - now over 2500 Sq.Ft. Big Ticket Items Updated: Silestone Countertops, Tile Roof Underlayment (2016), HVAC (2010), Master Bath (now with Walk-In Shower. Other features include Solar Panels (Owned-Tremendous Savings on Electric), Brick-Paved Driveway and Front/Back Patios, Upgraded Cabinetry, Sunscreens, Ceiling Fans, Fireplace in Family Room, Granite Vanity Top, Built-In Desk in Den, Decorative Pot Shelves and Niche"